Eye Injuries and Eye Doctors: To See, or Not To See? Have you ever scratched your eye on accident? This could easily be done by something like an article of clothing, hairbrush, or even a fingernail and cause what is called, a corneal abrasion. These types of injuries are considered pretty minor and usually cause discomfort for only a few minutes and then go away; however, there are incidents where simple corneal abrasions can cause more serious complications which require medical assistance. Chemical burn on the eye is another common occurrence, as well as penetration of the eye from an object and ocular swelling from being bludgeoned. So, what is most commonly the cause of these eye injuries? Well, most of the time eye injuries occur because people don't take the necessary safety precautions to protect their vision. That's right, most causes of eye injury are completely preventable! Day-to-day stuff may seem like “business as usual,” but some of it can be dangerous. For instance, as mentioned above, using home cleaning products, can harm your eye very badly if you aren't being careful. Playing sports opens your eyes up to increased chance of physical injury and heightened sun exposure that can cause long term damages to your vision. It might surprise you to learn just how many of the annual eye injuries that happen around the world are from day-to-day routine activities. Well, when is it the right time for me to seek medical attention? Hey! Listen, in this case common sense is going to be your best friend. Let’s say for instance you poke your eye with your finger by accident and it hurts for a couple minutes, but goes away with no lingering issues—this probably isn't a big deal! Now, if you accidentally stuck a sowing needle into your eye, you might want to consider seeking medical attention. If you ever get chemicals in your eye, immediately seek medical attention—and the bar of soap in your shower doesn't really count (unless of course your eye becomes incredibly inflamed and irritated and doesn't show any sign of clearing up. If for some reason this happens, seek medical attention). Morale of the story? If you ever find yourself concerned over an injury sustained to your eye, give your eye doctor a call! Most importantly though, do NOT rub your eye if you feel you may have a serious eye injury. Doing so puts your eye at risk of infectious bacteria that could only cause more problems. Yikes! 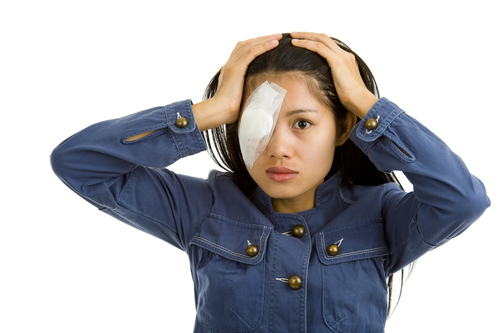 Eye injuries sound pretty serious; how can I prevent them? Rule #1 – Wear safety glasses if you are working in an environment where particles or harsh chemicals could fly up into your eye. This encompasses a multitude of situations from running a wood chipper to simply cleaning the shower. Rule #2 – Be mindful of your eyes when doing day-to-day activities that means not sticking your hair brush into your eye! Rule #3 – Always be sure you are wearing the proper safety gear when participating in outdoor activities such as sports, hunting, and flying a kite (Yes! Even kites could hurt your eye, granted you would have to be really bad at flying one). As mentioned earlier, don't take any chances if you believe you have endured a potentially damaging injury to your eye, call your eye doctor and get seen so that your eye can be treated before the damages get worse.